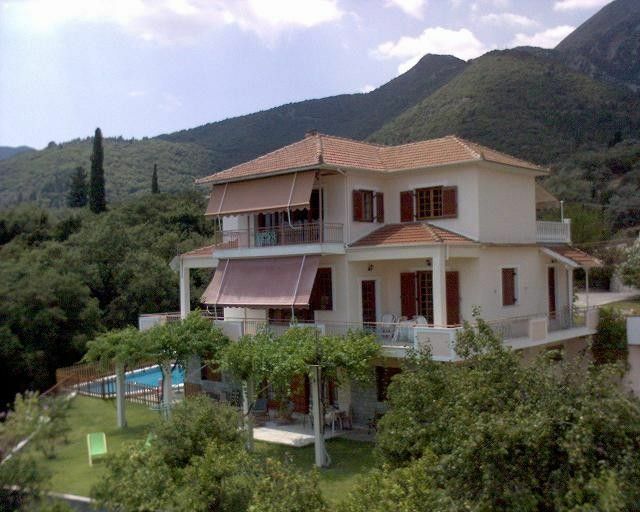 Villa s groundfloorapartment with 60 qm private swimming pool. This 150 sq.m. villa's ground floor apartment is located east of Lefkas Island, 1,2 km far from the touristic center of Nydri, and enjoys full privacy. Situated within 2000 sq.m. of lawn area, amidst a beautiful garden of all kinds of trees and a forest beside the 60 sq.m. private swimming pool. The view at the sea and the small islands around (including Onassis Scorpios) is marvelous, the whole environment very serene and relaxing, quiet, ideal for children who need an outside space for playing. The owner lives on the third floor and is happy to share with you information about the local culture. The car is essential so that you can roam around the island of Lefkas. Finally, I think the less subjective one speaks about his property, the more attractive makes it for the objective viewer and that’s the crucial difference. The villa is located beside a forest, among olive trees,inside a lawn area of 2000 qm and a garden with all kinds of fruit trees.So the environment displays everything a family would like to wish for its holidays. There is also a tavern just 200 metres far from the house.